The Cryostation s50 cryostat, Monatana Instruments' optical cryostat with closed helium cycle, is perfectly suited for optical experiments thanks to its high mechanical stability. The cryostat provides a temperature range of 3.2–350 K at a vibration level of just five nm. A fully automated operation eliminates the costly and time-consuming risk of cryogenic pitfalls. Closed-cycle means no helium is consumed, so your operational costs are minimal. After inserting the sample and entering a setpoint temperature, the Cryostation s50 will reach and maintain the temperature with stability unmatched by any other commercial cryogenic instrument. Up to five viewports and as much as 29 electrical feedthroughs in the standard configuration allow both optical and electrical measurements. Experimental setup and room temperature measurements in the Cryostation cryostat can be done with the sample area completely unobstructed. For lower or higher temperature measurements, a radiation and vacuum case can be set in place without disturbing the sample. 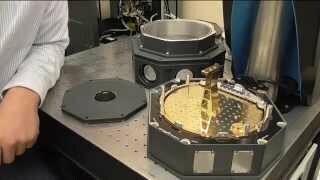 The cryostat sample mount incorporates custom filament-wound materials and an engineered platform which maximizes strength and compensates for thermal contraction. This provides a rigid connection to the optics table with little or no drift with each new setpoint. The cryostat provides both low temperatures and low vibrations. Peak-to-peak vibrations are less than five nm, and RMS vibrations are less than 0.25 nm. This is achieved with a patent-pending design which maintains a typical base temperature of 3.2 K and a typical active load cooling power of 0.1 W at 4.2 K with all five optical access windows in place. The cryostat compressor utilizes variable helium flow technology. Since most of the experiment is performed at a stable temperature setpoint, the system will operate at an input power that is appropriate for the sample temperature so no energy is wasted. The Cryostation cryostat can also run in standby mode which allows the system to stay cold while using less than 1 kW of power. Temperature drift is a problem in both liquid helium and closed-cycle systems. Using patent-pending active and passive temperature stabilization, Cryostation achieves long- and short-term temperature stabilities of less than 10 mK peak-to-peak. This is even achieved at temperatures below 4 K. The Cryostation will automatically stabilize at the user-defined temperature setpoint. A number of processes are automated by the cryostat including vacuum pumpout, cooldown, temperature stabilization at setpoint, warm-up, and purge with dry nitrogen to keep the system surfaces, sample and optics clean. Compressor parameters are automatically optimized to minimize cooldown time, conserve power and reduce wear on the system. Diagnostics and monitoring of many system components are automatically performed, making troubleshooting a more straight-forward process for the user or a trained technician who can be networked onto the system as long as an internet connection is provided to the Cryostation. The Cryostation is controlled with a Windows-based program running on a mini-notebook computer. Using OLE Automation, the Cryostation can be driven by another device using LabVIEW, for example, for total experiment automation. The system can also be monitored and controlled via any computer with internet access. In addition to the included four thermometers and three heaters, the system is provided with 29 electrical connections into the sample area, terminating with three miniature connectors. Thermal lagging locations for multiple wires are provided so that the sample stage temperature is maintained. The cryostat was engineered with an intentional separation of the sample environment from the cryocooler. This allows optical access from above and radially in the same system and at the same time. The flexible, modular design also allows new sample areas to be constructed and easily implemented. The Magneto-Optic module takes the standard Cryostation and adds up to a 0.7 Tesla magnetic field with incredible optical access and experiment flexibility. 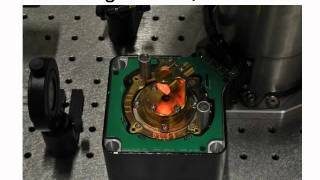 Optical access through the poles, high NA access from the sides, and low-working distance access from the top make demanding magneto-optic applications simple to setup. Focus on your sample at temperatures down to 3.5 K with unparalleled accuracy. Drift is virtually eliminated using our patent pending design, including low drift during cooldown. The low working distance option allows users to use external optics and achieve a working distance as low as 1mm. The components to achieve the low working distance configuration include a thin vacuum window, a raised radiation aperture, and a thin radiation window. The sample can be placed close to the overhead optic. The tall round castle was designed such that a superconducting magnet with room temperature bore could be placed around the top portion of the castle. This allows overhead viewing of the sample. The tall rectangular castle was designed for use with GWM magnet poles or other external magnets. The windows on the side also allow the castle to be used for high numerical aperture applications. The high NA castle was developed specifically for low working distances and high numerical aperture transmission experiments. The piezo rectangular castle allows the use of piezos to move the sample in the rectangular castle format. The low working distance rectangular castle allows low working distance and convenient electrical cabling in the rectangular castle format. The short round castle has a 1" OD and allows low working distance overhead. The Cryostation can incorporate precision nano-positioning stages on the standard platform, or using an optical recessed platform. 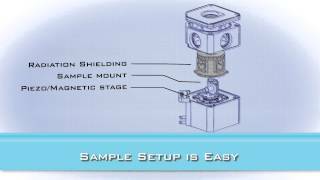 These piezo motion stages are integrated into the cold space for translating, rotating, or tilting your sample. Montana Instruments integrates and tests the unit so it is ready when you are. To keep the sample within 0.2 K of the platform temperature, a flexible thermal link is provided to thermally connect the cold stage to the sample mount.